2. Grease a 10 x 15 inch baking sheet pan. 3. Beat butter, egg yolk, orange juice, and sugar together. Sift flour and baking powder together and gradually add to wet ingredients. A sticky ball of dough will form. Flour your hands and remove the dough. Place dough on the center of the greased pan. Press dough into pan evenly to cover the entire bottom using your finger tips to push the dough in place. When the pan is completely covered by dough, bake in the oven for 10 minutes. 4. In the meantime, beat 2 eggs, leftover egg white, butter, 3/4 cup sugar and vanilla. Then stir in pecans and set aside. 5. Remove baked bottom layer from oven and immediately sprinkle chocolate chips on top of the layer evenly. Return to oven for 2 minutes. Remove pan from oven and spread chips with a butter knife to make a thin layer of chocolate over the whole pan. 6. Stir the pecan mixture to make sure it is well blended and then pour over the chocolate layer. Spread evenly over chocolate. 7. Return pan to oven. Bake 30 – 35 minutes more or until lightly browned. Cool for 20 to 30 minutes before cutting. Loosen sides of cookies all around the edges of the pan with a knife then with a serrated knife, cut the cookies into 64 equal squares. 8. ENJOY! 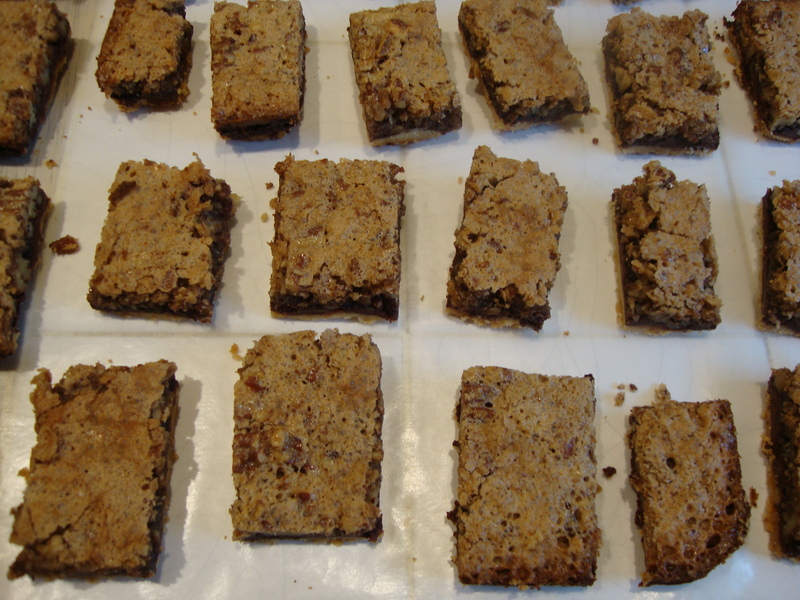 – BAR NONE, best cookie bar around! Landau cookies are on the top of my list as far as bar cookies go. My good friend and neighbor, Laurie, gave me the recipe years ago. It was so old and faded in my personal recipe book, because it was one of my recipes that I had typed, yes, you heard right, typed with a typewriter. This recipe was altered to my taste a bit but it is and always will be one of Laurie’s signature cookies. Whenever I am fortunate enough to be at her table for a meal, and dessert is served, there is nothing better than Laurie taking out her big container filled with Landau cookies. On my cookbook shelf I have two tremendous binders that contain all my recipes organized in alphabetical order. Over half of the recipes go back decades and almost all of them were passed down to me from a family member or friend. Those recipes are the joyful treasures of my life. Each one reminds me of my mom, an aunt, a sister-in-law, a good friend and those friend’s moms. How many times have I heard someone tell me that they regretted not writing down their grandmother’s or their mother’s recipes when they were still alive. Fortunately for me, my recipe collection began as a teenager when my passion for cooking really kicked in. My father died and my mother, who was a good cook, lost the love of cooking for a few years. Cooking offered me an outlet and distraction from my own sorrow and feeling of loss. To this day I still feel passion for cooking. Back then, I would write down the recipes handed down to me. Those recipes in turn were updated on a typewriter, and today are now saved on this website for my children, grandchildren and future generations. At the time I didn’t know that I was preserving something very precious and irreplaceable. The recipes of my life, are more than just recipes, they are the memories of my life as well. Decorations – sprinkles, candies, etc. 1. Place the flour, baking powder and cinnamon into a bowl. Sift together. 2. In a mixing bowl, cream butter, margarine and sugars. Add eggs and vanilla. Gradually stir in flour mixture. Mix until a dough forms. 3. Cut dough in half and place into 2 separate Ziploc bags. Chill for at least one hour or more in refrigerator. 5. Flour surface, (table top) where rolling out dough. Flour hands and rolling pin. piece of dough onto floured surface. Generously, sprinkle top of dough with flour. 6. Place cookie shapes onto ungreased baking sheets. Bake for 6 to 13 minutes, depending on cookie shape size, and oven temperatures (some ovens run hotter than others) or until lightly browned. Makes about 7 dozen cookies. 7. Cool completely on wire racks. Decorate with icings and colored sugars, sprinkles, etc. 8. ENJOY – Baked especially for you by a child’s little hands! Cookie cutters bring out the child in me. Whenever I see one, it makes me smile. Of course, you need a great recipe to put your cookie cutter to good use, and I just happen to have one for you! I’ve experimented with many cookie cutter recipes over the years, but none have worked for me as well as this one. However, don’t bother asking me where I found this recipe, I have zero recollection. Let’s just say it’s an oldie but goodie. I’ve enjoyed this recipe for both Easter and Christmas cookies, and anytime I need shaped cookies. Trust me, it’s fool proof. No matter how many cookies I have baked with my children and others over the years, and now with my grandchildren, there is no cookie more loved than this one. Children take great delight in choosing the cookie cutters and rolling the dough. What they especially love is icing and decorating these cookies. I recently made these cookies with my granddaughter, Mackenzie. She was so excited to use the rolling pin, and shared with me that this is her favorite thing to do. Could I have a budding baker in the family? Afterwards, she took a container full of cookies home to share with her brothers and parents. Bake some happiness with cookie cutters, flour, and a smile. What a perfect gift to give and to share with a child. One baked with love! 3. Cream butter and sugar until fluff. Add eggs and vanilla, blend well. 1/2 inch apart onto greased cookie sheets. pan, with a spatula to wire racks to cool. 7. Enjoy – Butter cookies with a twist! Happy Mother’s Day from Somebody’s Mom to all “Moms”! The greatest gift of all is your family. I will think of my mom, grandmothers and aunts today. I will say a prayer for them along with a thank you for all they have done for me. They may not be here physically, but they are still here with me in my memories and in my heart! These Cookie Twists are really the same recipe as my Sesame Cookies, but without the sesame seeds. But my little Chi Chi, my granddaughter Mackenzie’s nickname, likes rainbow sprinkle cookies and probably would not eat them with sesame seeds on them. Whatever my grandchildren want as far as food goes, I am always happy to comply! My grandsons, Jared and Tommy, love cheesecake. I bake them cheesecakes, both large and mini size. All three seem to enjoy my baked macaroni and cheese, homemade with lots of love thrown in. Brownies without nuts, chocolate chip cookies, and my spaghetti sauce also are all time favorites. As far as drinks go, there is a steady supply of ingredients to make Shirley Temples at a moment’s notice for the grandkids. I favor my own version which is different from the original drink. My Shirley Temples are made up of equal parts ginger ale soda and cranberry juice with numerous Maraschino cherries added for fun. Shirley Temple’s main ingredients consist of grenadine and ginger ale soda with cherries, but then some recipes call for real lime juice or lemon/lime soda. The only thing that matters to me is that the grandkids love my Shirley Temples, so I keep them coming. When you love to cook, it is a joy to cook for those you love for all the generations! 1. Preheat oven to 350 degrees. Place your oven racks closest to the middle of the oven as you possibly can. To bake evenly the middle is the best place to position your cookie sheets. 2. In a large bowl beat, with electric beater on medium speed beat butter until light and creamy. 3. Beat in sugar, eggs, and vanilla extract. 4. In a separate bowl, sift together flour and baking powder. 5. Gradually add the dry mixture into the large bowl until blended well. On the lowest speed gradually add pistachios and chocolate chips. Form into a ball. Remove the dough from the bowl to a pastry sheet. 6. Cover an ungreased cookie sheet with parchment paper. Sprinkle the dough and your hands with flour. Shape the dough into four 12-inch by 3 inch logs or as close to these dimensions as you can. Bake logs 25 to 35 minutes or until the logs are lightly browned and firm when touched in the middle. Remove from the oven. Leave the oven on. 7. Cool logs on cookie sheets for 10 to 12 minutes. If possible place the biscotti log on a cutting board, or leave on the parchment covered cookie sheet and cut with a serrated knife (bread knife) into about ½ inch diagonal slices. After slicing biscotti, space the cookies sporadically standing up them up on the cookie sheet. Bake the biscotti for 10 minutes or until lightly toasted in this position. Remove from oven and let the cookies cool completely before serving. Store in an airtight container in a cool, dry area. 8. ENJOY – Biscotti is best when baked with love…..
Biscotti are my favorite cookies, especially homemade pistachio biscotti. Pistachios don’t come cheap, but their flavor really comes to life when added to biscotti so they are definitely worth the cost. Problem is, everyone wants to snack on these little green jewels, so I’m forced to hide them until it’s time to make biscotti again! When I was a young girl, biscotti were cookies that my Gramma dunked in her wine. I never really saw anyone dunk their biscotti in wine until recently when I traveled to, and fell in love with, Italy. My husband, Tom, and I had the pleasure of meeting his cousins for dinner one balmy night, after which we were served biscotti for desert. The sight of one of his cousins dunking a biscotti in his wine glass brought that touching vision of Gramma front and center……I felt very much at home. My paternal Gramma was a tiny, 4’ 10” Italian lady who resided with my family in Queens 6 months of the year, and the other 6 with my father’s sister in Long Island. Gramma spoke with an Italian accent even though she was born on the Lower East Side’s Little Italy section of Manhattan. She loved to stay with us in Queens because she could walk to church and the local park, the two places closest to her heart. She was always coming or going to church, her rosary beads in tow. Coming home from school I would find her in her tiny room off the hallway either reading, watching TV, or praying the rosary … which I almost sensed were attached to her fingers! She also had a habit of twiddling her thumbs, which she could continue for hours. Some rare moments I find myself doing this to remind me of her. The park was Gramma’s other home away from home. She brought me there when I was in kindergarten, and I would sing and dance for her friends. In the days before there were senior centers, the benches in parks were filled with seniors who would gather there, talking about their children, grandchildren and just plain reminiscing. Gramma lived to 90 years old and drank a glass of red wine 3 times a day; a small glass of wine at breakfast, then one at lunch and lastly one at dinner. She was always smiling and happy to see me. Anytime I went into her room to watch a TV program she would gladly change the channel to accommodate me. There was a dollar for me every holiday from Gramma. If it was Ground Hog’s Day I would get a dollar and, even if there were no holidays, she would make one up. How could I not adore this woman? Biscotti will always remind me of my wonderful Gramma. Those memories are the nearest and dearest to my heart, and I will always bake biscotti in her honor! 1. Preheat Pizzille iron maker for a few minutes. 2. Beat eggs in a large bowl. Add the sugar gradually, while continually mixing. 3. Add cooled melted margarine and butter along with the vanilla. Blend well. Mix flour and baking powder together and gradually add to egg batter while beating continuously. 4. Dough will be sticky. Drop by teaspoonfuls of dough onto center of heated open pizzille iron designs one at a time. Cooking time should be a minute or less for each cookie to cook until golden in color. 5. In a very large pan sprinkle very generous amounts of Confectionery sugar to cover the bottom of the pan. When cookie is ready place on top of the Confectionery sugar and then sprinkle more sugar over the top of the cookie. Cool completely before placing in a container. 6. Options: Place batter in the refrigerator over night and take out a 1 / 2 hour before using. Use more pans to move the cookies around as you cook them so they cool quicker. 7. ENJOY! – Not pizza – pizzilles! I entered a cookie exchange contest with my pizzelle cookie recipe and lucky me, I was picked as one of the 12 finalist. Unfortunately, I didn’t win, but that’s how the cookie crumbles. My pizzelle cookies are my traditional Christmas cookie. I have been making them for years. I learned how to make them from my uncle’s mother who made them one at a time. She used a cast iron pizzelle maker that was hand held over the stove and turned manually. I remember she lent it to me once when I was about 15 years old. It took forever to make a batch of pizzelles, turning one cookie at a time over the stove. Today, I have two electric pizzelle makers and it still takes time and patience. But this cookie is definitely worth it. Christmas just wouldn’t be the same without pizzelles!